I salivate while merely typing "Cheddar Bay Biscuits." Yet, the delicious food isn't the only reason to frequent Red Lobster now that you are a parent. 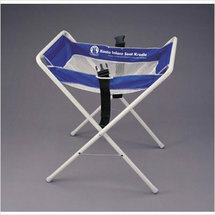 Red Lobster has these terrific Koala Bear Kare infant seat cradles to hold your infant's car seat at table-height. I feel this is a thoughtful touch and a welcoming change from placing the car seat on the floor or unsafely on top of a chair. Red Lobster also provides a little box of new crayons that kids can use to colour their own activity sheet, which doubles as the Kids' Menu. The crayons are theirs to keep.